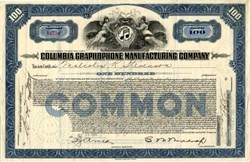 Beautifully engraved Certificate from the famous Columbia Graphophone Manufacturing Company issued in the 1920's. This historic document was printed by the American Banknote Company and has an ornate border around it with a vignette of two angels flanking the company's famous logo. This item is hand signed by the company's officers and is over 77 years old. The company Merged into Electric & Musical Industries Ltd (known as EMI) on 4/20/31.